Financial globalization paired with the relaxation of constraints on capital flows between countries before the 2008 crisis, increased merger activities among the World’s largest stock exchanges. The financial crisis of 2008 had a severe impact on the development of equity markets, corporate financial stability, and corporate governance, and a multi-step approach is needed to fully appreciate the causes and effects of this event. This book engages the separate strands of literature to advance a more holistic understanding of whether and how the national institutional environments in selected countries around the world has been changed after the crisis. 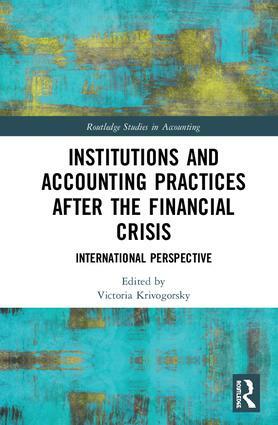 Institutions and Accounting Practices after the Financial Crisis: International Perspective sets out a framework for the analysis of institutional environments and accounting practices in in selected countries around the world during the pre-crisis period, followed by an examination of the impact of the crisis. It scrutinizes the changing roles of debt and equity markets; the shift in accounting practices and capital financing choices due to the economic downturn; and the lessons that can be obtained from the financial crisis, while considering the institutional architecture of international business environments. This ongoing process of integration and globalization increases interdependence between world markets, and allows shocks to propagate across national and continental lines, making the understanding of international markets vitally important to American investors. Aimed at primarily researchers, academics and students in the fields of international accounting, management and finance, Institutions and Accounting Practices after the Financial Crisis: International Perspective will additionally be of value to practitioners and policy makers, supplying them with information regarding the changes in accounting practices and risk evaluation due to the crisis. Dr. Victoria Krivogorsky is a Professor in the Charles W. Lamden School of Accountancy at San Diego State University.